The town of Nelson Bay lies at the heart of Port Stephens, and is ideally located to explore the area by bike. Bay Bike Hire offers easy to ride bikes that will easily transport you around the area and up and around the gentle hills along the bay. We also offer cruiser bikes, with a single gear and ideal for a relaxing summer cruise past the waterfront to one of the many cafes and bars. Port Stephens is great for cyclists and bike riders from serious mountain bikers right through to families who enjoy a safe and scenic bike ride. A Port Stephens bike ride offers amazing views and very little traffic (after all we only have single lane roads and only one set of traffic lights). From Salamander Bay right through to Fingal Bay... with some spectacular waterviews as you pass from Bagnalls Beach to Dutchies Beach to Nelson Bay, some shaded riding through bush, reserves and plenty of parks, playgrounds and cafes along the way. 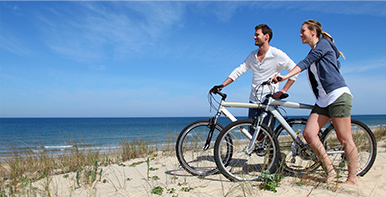 Port Stephens Council has approximately 50km of shared cycleways throughout its communities. These consist of links between recreation areas, schools, business centres and community facilities. Several long routes are available including 2km, 8km and 12km routes that are ideal for family outings, commuting or recreational riding and walking connect to well maintained picnic, bbq and recreation areas. © Copyright Nelson Resort & Conference Centre 2013. www.nelsonresort.com.au All rights reserved. Privacy.